The Professor is humble, but let’s not forget how sick he is. 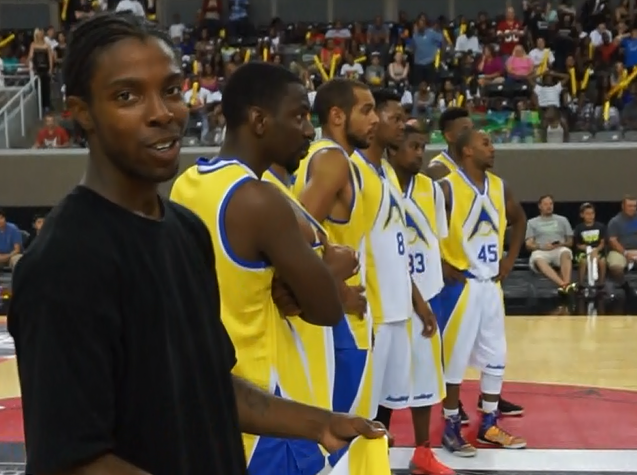 In every city on the tour, a team of local talent, assembled earlier in the day at an open run, faces off against the Ball Up All-Stars, including streetball legends The Professor, Bone Collector, AO, Sik Wit It and Air Up There. The team is coached by former NBA world champion and 12-year vet Tracy Murray – which warrants special mention, because as a teenage basketball junkie in the 90s, I used to love watching him stroke the three-ball from deep. 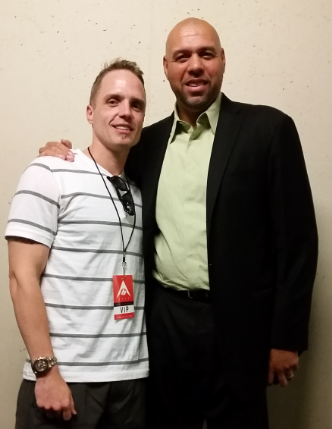 So when I saw him leaning against a wall in the lower level of Ralston Arena, I had to tell him that. And, have my daughter take a pic. It’s a literal competition, pitting the hungriest ballers against the Ball Up All-Stars in front of their families and hometown crowd. The Ball Up team has everything to lose, while the local team has everything to gain. The mix of combustible elements creates a great fan experience. Plus, there is not a sniff of zone defense, which is what made the NBA great at one time. As far as making the team, at a Ball Up event, you get to watch the drama unfold, as it did for the former Grayson Boucher, aka The Professor, with two players from the local team (as the full squad stands in the middle of court in front of the entire crowd) selected to move forward in the competition at the conclusion of the game. 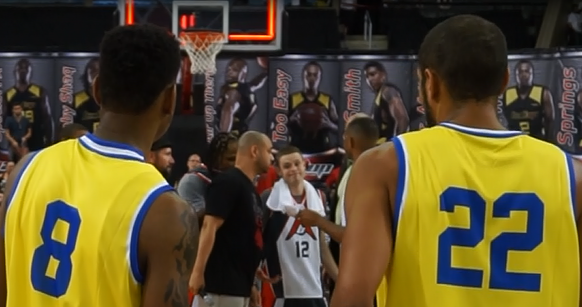 It’s high level basketball and a reality show right in front of your eyes. Below, Ball Up CEO Demetrius Spencer, The Professor and the New Orleans Pelicans’ Eric Gordon determine who will move forward, while two participants anxiously await their fate. 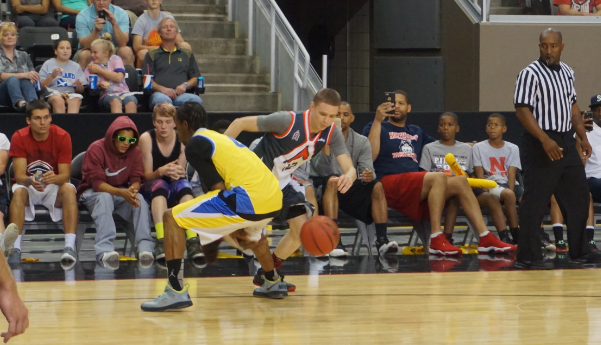 Two MVPs from each city are then invited to participate in a 20-person, two-day combine camp at the end of the tour. 10 finalists are selected from that to play against the Ball Up All-Stars in a championship game taking place in Ball Up’s hometown of Los Angeles. The MVP of that game earns a spot on the Ball Up roster and a professional contract worth $100,000. Each stop on the tour features an NBA guest coach. 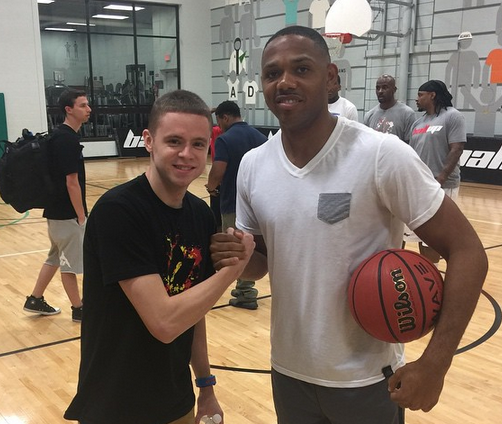 “I have a good relationship with Ball Up,” said Eric Gordon, the NBA guest coach for the Omaha tour stop. Nobody captures the energy and excitement of a Ball Up event like Sik Wit It, streetball icon and ball handler extraordinaire. Just like The Professor, Sik Wit It attended a tryout for the And1 tour that ultimately changed his life. Complete tour details, open run tryouts and ticket information is available at www.BallUp.com. Check out Ball Up on Twitter, Facebook, YouTube and Instagram.